Two actual scenarios illustrate the value of preparing a child to survive a house fire. A five year old boy playing with a lighter started a fire that took his life. Instead of getting out of the house, the boy tried to hide from the fire. Another boy, awakened by his mother when their house caught fire, calmly told her not to worry – the fire department had told him just what to do. Small children often try to hide under their beds or in a closet when a fire occurs. Fire safety educators tend to avoid negative statements (don’t hide in your closet) but to emphasize the appropriate actions to take (do get outside as quickly as possible). Sleeping with bedroom doors closed will keep intense heat, smoke, and poisonous gases out of the room. A child should be taught that the sound of a smoke detector is a warning that the house may be on fire. If a bedroom door feels warm to the touch, it should be left closed and escape made through a window. If checking on conditions in the hallway, the person should get down near the floor and open the door just a crack. If there is any rush of heat or smoke, the door should be slammed shut immediately. Strong emphasis should be placed on getting out of the house as quickly as possible if there is a fire, because fire produces “poison air” which is not visible like smoke. Since parents are not always able to reach their children during a house fire, children should be taught to escape through their bedroom windows. 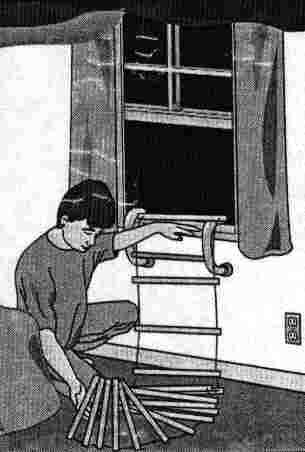 The child should practice opening the window without assistance, and be instructed as to how to cope with a screen or storm window. Children have these skills at their command, picking and choosing, without always understanding the end result. Many children under the age of 12 years help mom and dad light birthday cakes, fireplaces and the barbecue grill. We attempt to focus these learning experiences over and over. Children mimic these exercises, but they don’t always know or realize the safety aspects of such simple tasks. What is fire carelessness? Since some of our younger citizens are quite often left without adult supervision, they often experiment with elements beyond their understanding, creating circumstances damaging and sometimes fatal to others. Impress upon your child what fire is and can do. There are three elements required to create and maintain fire: heat, fuel and oxygen. Without these elements, fire won’t exist. When young people have the opportunity to help, impress upon them safety practices. Then watch them. Call it quality time, love or concern but, supervise and teach them about fire. Should children want to help with cooking, tell them about safety aspects involved in the activity such as removing hot pan lids or keeping handles of pans turned away from the lighted burners. When lighting the barbecue grill, express that wind changes and exposures are critical, too! All in all, provide a safe-sense approach when allowing small children to help.